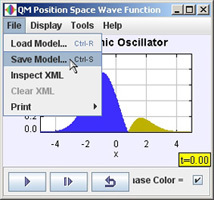 QM Superposition Program showing the Save Model menu item used to save model parameters as an xml file. 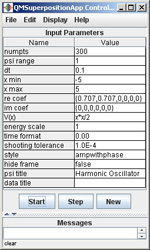 OSP programs can be customized by changing the parameters that initialize the simulation. These initial conditions are saved in xml files. For example, the QM Superposition program models the time evolution of superpositions of energy eigenstates. The changeable parameters are shown in the Figure below along with the resulting xml file that is automatically generated via the File| Save Model... menu item. Once xml files have been generated they can be loaded into the program they were created from using the File| Load Model... menu item. Individual xml files can also be edited by hand using any simple text editor. 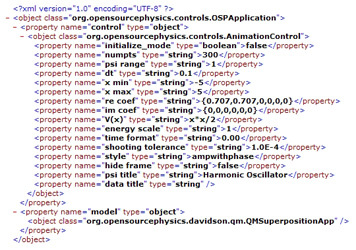 The Open Source Physics (OSP) project has defined an easy-to-understand xml vocabulary for the teaching of computational physics and the distribution of OSP-based curricular material. This vocabulary enables us to: store parameters (initial conditions) and results from a computer simulation, associate a simulation, a set of initial conditions and a narrative into a topical unit, and combine topical units into a curriculum module that can be further adapted and customized by an end-user. QM Superposition program's control window showing changeable parameters of the model and the resulting xml file generated by the File| Save Model... menu item. Extensible markup language (xml) is one of the most significant recent developments in information technology. Although xml is superficially similar to hypertext markup language (html), it allows authors to define their own vocabularies of opening an closing tags. The scope of xml is therefore much larger than html as it allows to create their own languages and allows data to be organized, cross referenced, and transferred between computers in a self-describing format. In general, xml files generated by and for a specific program are only readable by that program.